For many years soil analysis has been used as an aid to assessing soil fertility and plant nutrient management and this has been established in the Soil Index system widely used in the UK. Some alternative approaches based on the ratio of certain cations in soil (Base Cation Saturation Ratios) and the use of soil audits are being promoted as better approaches to plant nutrient management. There is much confusion about the validity and appropriateness of these approaches. This leaflet reviews the existing Soil Index system and examines the principles and some of the claims made for the BCSR and soil audit approach to soil nutrient management. Achieving and maintaining appropriate levels of soil fertility, especially plant nutrient availability, is of paramount importance if agricultural land is to remain capable of sustaining crop production at an acceptable level. Soil sampling and analysis is the first of three equally important steps in managing the nutrients required by plants. The second is the interpretation of the analytical data leading to the third step, recommendations for nutrient additions, as fertilisers or manures, to optimise crop yields while minimising any adverse environmental impact from their application. Currently recommendations for nutrient additions to soil are based on well-tried and tested methods of soil analysis. Recently however soil audits, involving additional analyses, and recommendations based on different approaches to the interpretation of analytical data are being offered to farmers. Are these recent introductions useful, valid and cost effective? This article seeks to address these issues. The productive capacity of a soil depends on often complex and sometimes little understood interactions between the biological, chemical and physical properties of soil. Good farm practice aims to manage the various factors that make up each of these three properties to optimise the yields of crops in environmentally friendly ways. Although the focus of this article is on plant nutrients, managing these properly is only one part of best soil management practice which also involves consideration of soil organic matter, soil structure, and the maintenance of a thriving soil microbial population. Soil analysis is an aid to managing soil nutrients efficiently to maintain soil fertility for those nutrients like phosphorus (P), potassium (K) and magnesium (Mg) that are retained in soil in plant available forms. If the amount of any of these nutrients in such forms in soil is too small then yield is jeopardised, but increasing reserves in agricultural soils to very high levels is an unnecessary expense. Thus the concept of increasing plant-available P, K and Mg in soil to a critical level in soil has been developed and is discussed here. 3. Soil analysis and soil nutrient status. For many decades soil scientists have sought ways of indicating the availability to plants of nutrients, like phosphorus, potassium and magnesium. The total quantities of these which occur in soil can be large although invariably not all is plant available. For advisory purposes analytical procedures for ‘plant-available’ nutrients have to be quick and reproducible; over time appropriate chemical extractants have been found and are now widely used. Once a reliable analytical method for assessing the readily plant available status of a nutrient in soil became established, fertiliser recommendations were based on this method of characterising soils. Soil analysis, however, is of value only if adequate attention is paid to the rules and methodology of good sampling, see for example PDA leaflet 24 on soil sampling and analysis. Soil acidity (pH), which rarely affects the growth of most crops directly in the range 5.5-7.5 but can influence the availability of other nutrients. The total amount of soil organic matter, which affects soil structure and/or nutrient availability, although it is not yet practical to give critical values for most soils (see later). The readily plant available mineral nutrients, such as P, K and Mg. When considering P, K and Mg in soil in relation to their availability to plants they can be thought of as existing in a number of pools as shown in Figure 1. Figure 1: A simple schematic representation of the phosphorus, potassium and magnesium reserves in soil in the pools of differing plant-availability. Note that in fact the pools are of very different sizes, i.e. they contain very different quantities of the nutrient, with these increasing from left to right in the Figure. Roots take up both P and K from the soil solution but the amount, especially of P, is very small. However, as P and K are depleted by root uptake they are replenished from reserves in the readily available pool; as this pool becomes depleted of P and K they are replenished, in turn, by reserves in the less readily available pool. The amount of P and K in the readily- and less readily-available pools depends on the past history of fertilizer and manure additions, P and K removals in harvested crops and the soil type. When P and K are added to soil they become distributed between these three pools and the most important feature shown in Figure 1 is the reversible transfer between the pools. The essential feature in crop nutrition is that there must be sufficient P, K and Mg in the soil solution and readily available pool to meet both maximum daily demand for each nutrient in the early stages of growth and the maximum uptake to achieve optimum yield. Currently in England, Wales and Northern Ireland readily plant available P is determined as Olsen P, while K and Mg are determined as exchangeable K and Mg, denoted Kex and Mgex. Using these well tried and tested methods of soil analysis, soils can be classified on a descriptive basis: ‘very deficient’, ‘deficient’, ‘satisfactory’ or on the basis of a probable response of a crop to an application of fertiliser, i.e. : ‘very responsive’, ‘responsive, ‘not responsive’. Alternatively, the analytical results normally presented as mg P/litre and mg K/litre, can be expressed as an Index. Indices used in the UK range from 0 (deficient, very responsive) to 9 (very enriched soils, not responsive). So firmly established and reliable had this approach become that it was eventually formalised in principle in the first edition, published in 1971, of MAFF Bulletin 209, Fertiliser Recommendations for Agricultural and Horticultural Crops. The basis of this publication has remained unchanged although refined in detail in subsequent editions; the latest 8th edition, published by Defra in 2010, is now called the Fertiliser Manual (RB 209) (ISBN 978-0-11-243286-9). There are two ways of relating fertiliser recommendations to soil analysis using the Index system. Both require the interpretation to have been developed from statistically valid field experiments that relate crop response to soil data obtained by agreed, reliable methods of soil analysis. If such experimentally derived relationships are not available any interpretation of the relationships between soil data and fertiliser recommendations must be questioned. Figure 2: Relationship derived from experiments showing the yield response curve to applied potassium, in this case the yield of sugar from sugar beet. The first and most often used method is to conduct a series of experiments with the same crop on a number of sites with different levels of the readily plant-available nutrient, P, K or Mg, being tested, i.e. soils at different soil indices. In each experiment, yields are measured on plots with a range of amounts of the nutrient being tested, all other inputs being kept the same on all plots. An example for K is shown in Figure 2. When the data from many experiments are assembled, there will be a range of soil P or K or Mg levels and the response of the crop to fresh P or K or Mg at each soil level. The lowest soil level at which there was no response to P or K or Mg is the critical level for the plant-available nutrient for the crop and soil type on which the experiments were done. Also at each soil level, the amount of P or K or Mg to add as fertiliser or manure to reach the maximum yield will be seen. Such experiments must be conducted on a range of soil types and over a number of growing seasons and this makes acquiring the data expensive. However, over time very extensive databases can be accumulated and reliable general recommendations produced, as with RB 209. The second method is to establish plots with a range of soil nutrient levels, i.e. different index values on one site. An example for P is shown in Figure 3. Maintaining all other inputs the same, yield can be related to the soil index. The point at which the response curve levels off (reaches the asymptote) will be the “critical value” for that crop and soil type. Below the critical value yield will be lost, a financial penalty to the farmer, while maintaining soils at much above the critical value is an unnecessary expense. In Figure 3 the critical asymptote can be seen to be between 15 and 20 mg/kg Olsen P, which is Index 2 on the RB 209 scale, and did not change with yield. Figure 3: The consistent relationship between Olsen P and the yields of spring barley grown on a silty clay loam in seasons with differing growing conditions. This method defines the critical value with some accuracy for that soil and farming system. In part, this is because each experiment with its range of soil index values is under one management. For example, in Rothamsted experiments, Olsen P frequently accounted for 70% and more of the variance (i.e. the estimate would be considered reliable) between the yield of potatoes, sugar beet, spring barley and winter wheat and Olsen P. Using this approach, once the soil is at or just above the critical level, fertiliser recommendations are based on replacing the amount of nutrient removed in the harvested crop, maintenance dressings. If the soils are below the critical level more nutrient can be added and less (perhaps none) if the soils are well above the critical value. The extra addition or withholding of a nutrient continues until the soils reach the critical value. To ascertain when this is reached the soil should be sampled and analysed every 3/5 years. In general, both approaches show that maintaining soils at Index 2 for P, K and Mg ensures that there will be sufficient of all three nutrients for most arable crops and grassland. The best reason for doing this is because none of these three nutrients move freely through soil. In consequence, a crop’s response to their application will depend on the way in which they are applied and mixed with the soil volume explored by the roots. Maintaining an adequate amount of each in the top soil gives roots the maximum opportunity to find them. Although nutrient inputs, both as fertilizers and manures, should be based on soil analysis, queries do arise occasionally from farmers and their advisors about data they have received, usually when results are not as expected. The first is that the sample was not representative of the whole field. Separate samples should be taken from those parts of the field that are obviously different and each sample should consist of 16 to 25 individual soil cores thoroughly mixed. The second cause can be because the soil sample is air-dried and ground to pass a <2 mm sieve to get a uniform sample for analysis. When interpreting the analytical data it is essential to remember that because a <2 mm sample was analysed, the data only apply to the amount of this soil fraction that the roots can explore to find the nutrients they require. The amount of fine soil will depend on the depth and stoniness of the soil and soil structure governs how extensive the root system is. Invariably the soil within a field is not uniform so that the analytical data for the final bulked sample depend on the relative number of individual soil cores taken from each area with a different level of readily available P, K and Mg. If these proportions differ at different sampling times then the results will vary. Lack of change over a period of years can be explained by the fact that the P and K measured by soil analysis is that in the soil solution and the readily available pools (Figure 1). But the P and K in these two pools is in equilibrium with that in the less readily available pool (Figure 1). When more P and K are applied than the amount removed in the harvested crop, some of the residue stays in the readily available pool and some, usually a larger amount, goes into the less readily available pool and because the latter is not measured by soil analysis, the soil analysis value does not increase as much as might have been expected. Conversely, when no P and K is applied some of that taken up by the crop comes from the less readily available pool and the soil analysis value does not decrease as much as might have been expected. 4. The Base Cation Saturation Ratio (BCSR) system. Recently a different approach to giving advice on fertiliser recommendations, the BCSR (Base Cation Saturation Ratio) method is being offered in the UK. Judged by its title, this system should be concerned only with the four “base cations”, calcium (Ca), magnesium (Mg), potassium (K) and sodium (Na). But in practice it is often suggested that additional analyses be carried out to provide a “soil audit”. The cost of this greatly exceeds that for the analysis for P, K and Mg required for the Index system. The BCSR approach is also being promoted as being more in tune with the ecology of the soil and is therefore environmentally desirable. It claims that the adoption of its recommendations stimulates biological activity and good soil “condition and life”. Such improvements are said to utilise soil processes to, for example, unlock and make available the nutrients in soil. However, there are no publicly available research or trial data to support such claims. Equally importantly there is no evidence to show that these conditions are not being delivered by the normal good soil management practices to which most farmers aspire, without recourse to expensive soil analysis. The advocates of the BCSR system in the UK base their approach on that in a book first published in America in 1993, namely, “Neal Kinsey’s Hands-on Agronomy”, by Neal Kinsey and Charles Walters, published by Acres USA, Metairie, Louisiana. The concepts in this book are attributed to Professor Wm. A. Albrecht, a respected scientist at the University of Missouri (USA) from 1916 to the mid 1950s when he retired from his university appointment. In that period, I can find no record of any published papers in refereed, scientific journals by Professor Albrecht that discuss the BCSR system for managing the nutrient status of soil. The underlying concept of the BCSR system is that there is an ideal ratio for the readily extractable base cations, Ca, Mg, K and Na, in soil. Additionally that there is also an ideal ratio between the total of these four base cations and the total cation exchange capacity (CEC) of the soil. The total CEC includes the four base cations plus mostly hydrogen (H) but including any other elements present as cations, the amounts of the latter are usually very small in most UK soils used for agriculture and are disregarded. Presenting an ideal fixed ratio proved difficult because there was no evidence for such a ratio in the scientific literature. A researcher in Prof Albrecht’s laboratory working on Mg at about the time he retired concluded that there was no relationship between yield and the ratio of Ca:Mg advocated by the BCSR hypothesis. In fact there was a better relationship between yield and the quantity of available Mg in the soil, which relates to the Index system used in the UK. In other early publications describing research testing the hypothesis, various authors reported near maximum yields of lucerne on soils with Ca:Mg ratios varying from 100:1 to 10:1 rather than with a specific ideal ratio. Table 1: Base cation percentages used for the BCSR approach for soil amendments. So, for whatever reason, by the late 1950s rather than discard an unproven concept it was proposed to continue with the BCSR interpretation but allow ranges in the percentage (%) of the cations rather than single values as shown in Table 1. For example, Ca could vary from 65 to 85%, Mg from 6 to 12% and K from 2 to 5% of the total base cations. In the UK some proponents of the system are using single values rather than ranges (Table 1). Further extensive research on the BCSR system was undertaken in the US. In reporting one series of experiments in the 1970s the authors concluded: “emphasis should be placed on providing sufficient, but not excessive levels of each basic cation rather than attempting to adjust to a favourable basic cation saturation ratio which evidently does not exist, as others have also reported”. No exhaustive research has been carried out and published in the UK that could in any way contradict this conclusion. A soil audit, in addition to the cations, includes data for soil pH, organic matter, active humus, P and trace elements. When advice is given on P it appears to be based on categorising the soil as in the Index system. This raises the question that if the Index system is suitable for P why not for K and Mg? 5. Can the Index and BCSR systems be compared? 5.1. Accuracy of the determination of cation ratios in many UK soils. It appears that standard analytical methods are used to determine total CEC in soil and the base cations, Ca, Mg, K and Na in the BCSR system. For this system an accurate measurement of exchangeable Ca, Mg, K and Na is essential because the values are summed to give ‘total’ CEC, and to calculate the ratios of these cations. For many soils in the UK there is, however, a problem because the method used to determine exchangeable Ca overestimates the amount in soils with pH above 7 that contain particles of calcium carbonate (CaCO3, chalk/limestone). Thus, this analytical problem can lead to errors in the amount of exchangeable Ca for calcareous soils like many of those in the UK and, consequently errors in the calculated ratios of the base cations. In our usual recommendation systems we have no interest in exchangeable Ca, which relates to soil acidity. instead we recommend to maintain soils at an appropriate soil pH, pH 6.5 for arable soils and pH 6 for grassland soils. 5.2. Method of presenting the data for the base cations. Many farmers who sample their soils on a regular basis like to compare data from different sampling times to follow changes over time to see how their manuring policy is affecting the fertility of their soils on a field by field basis. It is impossible to easily compare data for the exchangeable cations when presented as in the BCSR system with the data as presented by most UK laboratories. This is because the BCSR system presents the results for the base cations in terms of their chemical equivalents, i.e. as milli-equivalents/100 g soil or as cmolc/kg soil, while most UK laboratories give the results in mg/kg together with the Index. So for the BCSR system the concentration of each cation in milligrams/100 g soil, as determined by analysis, has to be converted to milli-equivalents/100 g soil by dividing by its chemical equivalent weight. The data can be expressed in one of two ways, either the individual values for the four base cations are added together and each is then expressed as a percentage of the sum, or each of the base cations is expressed as a percentage of the total CEC if this has been determined. In either case the percentages are shown as a ‘ratio’. The extent to which the percentage of each cation is above or below its defined ideal value is the basis for a recommendation for action. Sometimes the concentrations are converted to quantities, kg/ha, by using an assumed or measured weight of soil per hectare. The ability to compare analytical data and recommendations is important; confidence is generated among users if recommendations from different sources are in agreement. 6. The ratio of cations in soils and in crops in relation to crop yields. The American literature of the 1950s gave a range of soil values for Ca from 65 to 85%, for Mg from 6 to 12%, for K from 2 to 5% (Table 1). From these ranges the ratio of Ca:K could vary from about 13:1 (65 ÷ 5) to 42:1 (85 ÷ 2). Thus the amount of Ca should greatly exceed that of K and the BCSR system suggests that the uptake of these cations by plants depends on this ratio. However, this is not so because the concentration of K in the plant always exceeds that of Ca, often by as much as six or seven times in actively growing crops. The plant, therefore, appears to be able to exert some control over the amount of each cation taken up and all that is required is that there should be sufficient readily available Ca, Mg, K and Na in the soil. 6.1. Grass yields and soil composition. The example in Table 2 illustrates that there is no relationship between cation ratios in soil, in crops and yields. It shows the percentage of Ca, Mg and K in the soil expressed according to the BCSR system and the ratio of Ca:K, and the concentration of the three elements in the grass grown on each soil and the ratio of Ca:K. The yield was similar on both soils, so the % composition of the grass was unlikely to be affected by the yield. The ratio of Ca:K in the Rothamsted and Woburn soils was 24:1 and 16:1, respectively, but in the grass grown on both soils the ratio of Ca:K was 0.2:1. Clearly the ratio of Ca:K in the soil had no influence on either the yield or Ca:K ratio in the grass provided that there was sufficient of both nutrients in the soil. Table 2: Exchangeable calcium (Ca), magnesium (Mg) and potassium (K) in soil expressed as a percentage of the sum of the three cations, the yield of grass1 grown on the two soils and the percentage of each cation in the grass dry matter. Average of four years’ data..
1 Ryegrass ley given 300 kg N/ha annually divided equally for 6 harvests of grass. 2 % determined as for the BCSR system. 6.2. Winter wheat yields and soil composition. To get over the problem of Ca and Mg in most soils the American publication referred to previously suggests that, in the ideal soil, the base cations should be 80% Ca + Mg, 5% K, 1% Na while the other cations would be 8% H, 6% other (presumably mainly aluminium (Al)). The soil pH would be about 6.5 with 8% H. Many soils in England and Wales have a pH 7 or above and therefore these soils would have less H and little or no Al as exchangeable cations. Table 3 shows, for two soils with pH 7.0 and 7.2, the ratio of the base cations to the total CEC, the yields of winter wheat and the base cations as mg/kg with the Index for Mg and K shown in brackets. The cation ratio for soil 1 was acceptable according to BCSR concepts, Ca + Mg was equal to 80 and K was 4%, and the yield of grain was 9.6 t/ha. For soil 2, % Ca + Mg was too large, 69 + 19 = 88, as was % K, 8% rather than 5%, but the yield nevertheless was a little larger at 9.8 t/ha than that on soil 1. The BCSR system would say that there was an imbalance in the cation ratio but even if this was correct there was no detrimental effect on yield. With the Index system both soils had sufficient Mg (Index 2 and 4) and K (Index 3) and this was reflected in the good yields. Table 3: The yields of winter wheat grown on two soils of contrasting base cation ratios but with sufficient potassium and magnesium in both. 1 includes all cations, not just Ca, Mg, K and Na. Some proponents of the BCSR concept use ranges for the percentage of each cation in the CEC so that the ratio of Ca:Mg could vary from 3:1 to 7:1 Ca:Mg. Reliable UK data show that good yields can be obtained on soils with Ca:Mg ratios well outside these narrow limits. Data in Table 4 are for two soils with ratios of Ca:Mg of 37:1 and 9:1 and on these two soils the yields of winter wheat were 8.5 and 8.0 t/ha grain and the larger yield was on the soil with the wider ratio. Table 4: Ca:Mg ratios in two soils with contrasting levels of magnesium (Mg) and potassium (K). The BCSR recommendations for soils with such a wide ratio would be to apply very large amounts of dolomitic limestone, containing magnesium rather than calcium carbonate. However, this would have been totally unnecessary. The Index values for K and Mg, also given in Table 4, show that both soils had sufficient of both nutrients to give good wheat yields; the ratio of Ca:Mg had no relevance. 7. Adjusting exchangeable calcium and magnesium in soil. Bearing in mind that it is the exchangeable cations in soil rather than the total amount that is important, the BCSR approach frequently recommends actions that are difficult to understand. For example, where Ca is higher than the target value the recommendation is to apply ammonium sulphate to remove excess Ca. But is this feasible and desirable? Many UK soils contain free calcium carbonate because they were developed from calcareous parent material and ammonium sulphate is well known for acidifying soil, both from the nitrification of ammonium ions and the by removal of Ca in drainage water in association with the leached excess sulphate. For many years, ammonium sulphate was used in an experiment on the silty clay loam at Rothamsted where it was applied annually at about 500 kg/ha. It took 40 years for the exchangeable Ca to decline from about 7,300 to 4,300 mg/kg in the soil. The decrease took so long because the free calcium carbonate in the soil was also dissolved by the acidification and, in consequence, fewer Ca ions were lost from the exchange complex than might have been expected. Where Mg is considered to be in over-supply the BCSR approach suggests that large amounts, often many tonnes per hectare, of calcium sulphate (gypsum) should be applied leading to excessive applications of sulphate. There is no experimental evidence in the UK that Ca ions will replace Mg ions on the exchange complex. 8. The importance of soil organic matter or humus. The terms soil organic matter and humus are frequently used interchangeably and have essentially the same meaning. Humus levels are not given as indexes because the level depends on the soil and farming system and critical values have very rarely been determined. Humus itself is largely the end product of the microbial breakdown of organic matter added to soil. The amount of humus in soil cannot be measured directly but is estimated by measuring the % carbon (C) and multiplying this by 1.72 to give % soil organic matter or humus. Humus is important in maintaining soil structure, in slightly increasing the soil’s water holding capacity and holding a small store of N, P, S and trace elements in organic forms. These cannot be taken up directly by plant roots but have first to be converted by soil microbes to inorganic (ionic) forms identical to those supplied in fertilisers. In general, in the temperate UK climate, soil humus levels increase or decrease only slowly moving towards a steady (equilibrium) value that depends on the farming system, the soil type and the climate. At equilibrium on the same soil type, a grassland soil contains more humus than an arable soil. Under the same farming system a clay soil will have more humus than a sandy soil. For these reasons it is only relevant to relate humus levels to an optimum level for an individual soil and farming system. Some of the larger target values being suggested for arable soils are simply not attainable unless large quantities of organic manures are applied regularly. Such large applications, if available to the farmer, would generally be regarded as beneficial so long they did not exceed the EU limit for N applications in Nitrate Vulnerable Zones (NVZs). Although large inputs of organic matter increase soil humus, once the inputs cease the level gradually declines. In a well-structured soil, roots can more easily exploit the mass of soil for nutrients and water. Although maintaining a good soil structure is as much a matter of cultivation and soil management as it is of soil humus content, farmers should be encouraged to maintain the humus content of their soils by incorporating available crop residues, including straw, and organic wastes, composts and manures. 9. Cation ratios and soil microbial activity. A BCSR soil audit frequently gives a value for what is called “active humus”, which is said to be important, and that there is an optimum base cation ratio for optimum soil “life”. The amount of active humus is always less than the total humus. It is well known that in soil there is a living population of largely microscopic organisms, often referred to as the soil microbial biomass, that is composed of a vast array of different species of bacteria, fungi and other organisms, some of which have specific requirements for soil pH. Many of these individuals can be identified but the amount of each is difficult to quantify. The size of the biomass is estimated by determining the % biomass carbon. Experiments show that only a very small proportion (at most 2-3%) of the total carbon in soil is in the living tissue of the soil microbes that are responsible for the biological activity in the soil. So, in general, there will be more active biomass in clay soils than in sandy soils because clay soils usually contain more humus. Most of these microbes are well adapted to the harsh environment of the soil but invariably they are hungry. They cannot function unless fed but they feed on organic material; the base cation ratio in the soil is irrelevant to their functioning. Some advocates of the soil audit approach suggest that to promote soil “life” various additives can be used, but it is extremely doubtful if they have any benefit. Even in a very impoverished soil with less than 1.0% carbon (equivalent to 1.7% organic matter) there will be some 400 kg biomass carbon per hectare. Consequently it is unlikely that adding an extra few hundred grams of a microbial preparation will have much effect. The measurement of biological activity or the amount and function of soil microbes still presents a problem because they are so diverse and their activity is difficult to correlate directly with crop performance. Until this is possible the interpretation of any measurements that are made will need to be considered very carefully before the methods can be adopted for advisory purposes. In the mean time, the best approach to having an active soil microbial population is to return as much organic matter as available to feed and maintain the existing well-adapted “local” population and ensure that it continues to thrive. 10. The release of nutrient reserves in soil. Soils invariably contain total quantities of plant nutrients that greatly exceed the amounts that are immediately available to plants. Two methods of increasing plant availability of this store of nutrients are being suggested, neither of which seems to have any reasonable chance of success. One suggestion is to apply ammonium sulphate to acidify the soil locally and increase nutrient availability. Acidifying H+ ions are released when soil microbes convert ammonium ions, NH4+, to nitrate ions, NO3–, but the resulting acidification of the soil occurs only in the immediate vicinity of the ammonium sulphate crystal, which may be remote from where the roots are. In consequence, even if nutrients are released there will be no benefit to the plant unless the root moves into the acidified soil zone. This method of acidification is likely to be much less important than that resulting from roots themselves excreting H+ ions that acidify the soil immediately around them and helping mobilise nutrients in soil in close contact with the root. In addition, when ammonium sulphate is applied to calcareous soils there is a risk of gaseous ammonia being produced and lost to the atmosphere. The other suggestion is that increased microbial activity will unlock significant reserves of soil nutrients. This does not occur. The idea was suggested in the early 1800s based on the fact that soil microbes produce carbon dioxide (CO2) by respiration. The CO2 dissolves in the soil solution to produce a weak acid, which, it was suggested, could attack soil minerals releasing K, Ca and Mg. Experiments at Rothamsted in the mid 1800s tested this idea by feeding the soil microbial population a carbon rich diet to get them to produce more CO2 and hence more acid. But yields on the treated plots were not increased above those on the untreated soil and these yields were very small and today would not be economic. 11. Cation ratios and soil physical properties. Proponents of the BCSR system in the US claim that an incorrect ratio of Mg to Ca causes the soil to be “tight”, implying that it is compacted with a poor structure. Certainly there are a few soils that are difficult to cultivate and have a high Mg content. But the high Mg content is related to the composition of the parent rock and the soils contain a large amount of clay that has been compacted in past times. There is no evidence of similar effects in the UK. Where there are soils with relatively large amounts of Mg they have developed over magnesian limestone or where this limestone has been used to raise and maintain soil pH. Such soils often have an Mg Index of 4 or 5 and only a small amount of K. However, provided sufficient K is given, such soils with irrigation can give 60 t/ha of high quality potatoes for processing. Few, if any, field-grown crops are more sensitive to soil structure than potatoes! Soil structure, especially natural compaction, is related to the proportion of sand, silt and clay particles and the amount of soil organic matter. On some soils the proportion of the mineral particles is such that the clay and silt pack into and fill all the voids between the coarse sand particles. This tightness or dense packing reduces the number of pores containing water and air (oxygen is needed for microbial respiration). If, because of the parent material, the soil has both the prerequisite proportions of mineral particles and a large amount of Mg it could be both tight and have a high Mg status but the high Mg status is not the cause of the tightness. 12. Muriate of potash, chloride and soil health. Some of those offering advice to farmers claim that the K in autumn-applied muriate of potash (KCl) is leached from the soil over winter and is not available for crop uptake in the spring. This is in complete contradiction to the evidence from trials comparing autumn versus spring applied K and from studies on K leaching into subsoils, which occurs only on the sandiest soils. For such coarse textured soils, advice has always been to apply K fertilisers in spring. Other claims have been made suggesting that the chloride content of muriate of potash is harmful to soil bacteria and micro-organisms. There is no evidence for these claims on UK soils or under UK farming conditions. The explanation offered is that chloride in the soil is converted to chlorine (an unpleasant toxic gas) or to hypochlorite (a sterilising agent) and that these decrease soil biological activity and reduce the natural release of K from soil reserves so that more fertiliser has to be applied. Chloride, whether from muriate of potash or rainfall or organic manures, is not converted to chlorine or hypochlorite in soil and adding muriate of potash cannot be harmful to soil microbes. Muriate of potash (potassium chloride) currently provides some 95% of all the potassium applied in this country and it has been used for more than 100 years. If it had any adverse impact on soil ecology this would have been seen by now. When potassium sulphate and potassium chloride have been compared in field experiments the yields have shown no detrimental effect of the chloride ion. Maintaining the fertility of our agricultural soils is of paramount importance not only for the present but for the future also. Soil analysis and its interpretation is an important management tool in assessing the need to apply nutrients in fertilizers and/or manures to maintain soil fertility. The current methods of soil analysis assess the plant-availability of nutrients in the depth of soil sampled, RB 209 recommends the top 15 cm for fields growing arable and field vegetables and the top 7.5 cm for permanent grass. The analytical methods used have stood the test of time and characterise the soil, using soil index values in the UK system adopted for RB 209, on the basis of the quantity of readily plant available nutrient extracted by an appropriate reagent. Fertiliser recommendations are related to the soil index and have been developed from an extensive database resulting from very many field experiments made over the past decades. The recommendations have wide applicability, although they may need to be modified for individual soils and farming systems in the light of local experience. This is in part because only the fine soil (less than 2 mm diameter) is analysed. Thus soils that are very shallow or stony have little fine soil and it may be necessary to increase the amount of nutrient recommended a little for such soils. Equally if the soil is very compacted or has a poor structure so that the plant has only a poor root system to scavenge the soil for nutrients, then again it may be necessary to increase the recommendation a little. While little can be done about shallow or stony soils, invariably it will be better to relieve soil compaction and improve soil structure than to apply extra mineral nutrients to meet the needs of crops. Some of these issues which can lead to modifications of fertiliser recommendations are resolved if the critical nutrient level for each soil and farming system is assessed and then maintained by applying the amount of nutrient removed in the harvested crop. The Index system of differentiating soils on the basis of soil analysis and likely response of crops to fertiliser additions currently provides the best practical approach to plant nutrient management. 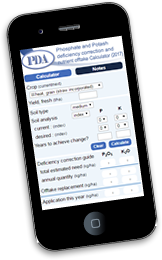 Basing fertiliser recommendations on soil analysis and the index system offers considerable benefits for it ensures that nutrients are applied if needed and provides a guide to the amount required. Current methods of interpretation simply aim to ensure that there is sufficient of each nutrient in readily plant-available forms to ensure optimum yields and the financial viability of the farm enterprise. The system uses simple, well tried and low cost methods of analysis as a part of a whole soil management programme that recognises the paramount importance of ensuring that all those biological, chemical and physical soil properties that control crop productivity are at optimum levels. Unfortunately generally agreed methods of analysis for some of these factors are not available. Claims for the validity of methods and the interpretation of the data produced, that are not supported by good experimental data lead to confusion and should be questioned seriously for any benefits before they are adopted.